TDIndustries provides construction, truck based service and facility management solutions for airports and aviation buildings. TD has a long track record of providing life-cycle solutions for airline facilities such as Dallas/Fort Worth International Airport, Houston George Bush Intercontinental Airport and other regional airports. 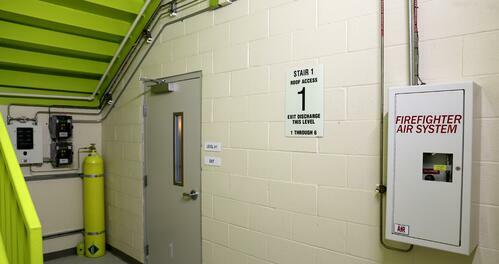 TD understands that airports and aviation facilities have unique environments where safety and security are essential. TDPartners exercise the highest standard of safety possible when working around not only toxic and combustible equipment like aircraft and fueling trucks, but also airport personnel and traveling guests. Safety is not a checklist item on a form—it’s at the heart of all we do. 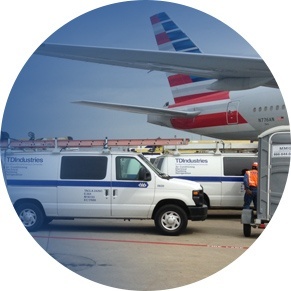 See why our aviation customers like DFW International Airport feel safe with TDIndustries. For years, TD has been building mechanical systems at airports that serve the international community. Coordinating with project teams and airport personnel to schedule shutdowns, our TDPartners create mechanical systems that meet the comfort and efficiency needs of your facility. Whether you need a plumbing emergency resolved or are looking for longterm facility management, rely on TD to be your go-to contractor. Onsite facility management services allow you to get your flights off the ground while our reliability, professionalism and safety work behind the scenes. Our strict adherence to security regulations and timetables provide air travel facilities and airports a headache-free experience. Plus our flexible scheduling means clients experience minimal delays in their operations.